> Blog>Giant flipcharts for big events>Write on a flipchart to be proud of! You can create your best presentation ever. The one that will make you proud. In the era of communication we are aware of the fact that all tools are necessary and useful to transmit information to the audience: videos, slides, infographics ... the more you have, the better it is. Who goes on the stage wants to grab the interest of the audience and wishes to meet dynamic persons interacting among them. The coach wants to share his message in a professional, clear and influential way. If you work with a flip chart, you are surely conscious of the fact that actually this is the tool that mostly impacts on stages, in meeting rooms and in videos. The use of easels facilitates the empathy between the coach and the audience and increases the strength of the message. When listening to the trainer explaining an idea and contemporarily looking at him making it real on a sheet, it's sure that the audience will assimilate that keynote in a more effective way. The idea was seen growing and it embeds in an unforgettable way into the minds of the coachees. Many coaches use all communicative canals when they are on the stage: they express their message by voice (auditory), they write it on the board (visual), they involve the public with questions and answers. Some professionals for capturing the attention of the room, they heavily beat on the blackboard with their opened hand (auditory+kinesthetic): this technique communicates the contents effectively. The energy flows in the room, the public hear, write and draw the message and simoultaneously they see it on the flipchart. The lesson is clear, it's understood. this involvement, to this energy. 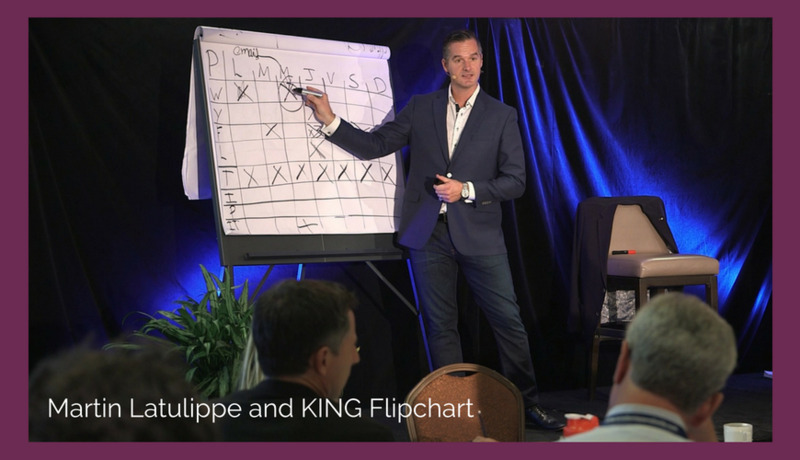 In the digital era the "old" flipchart is not a relic. On the contrary it is the most versatile and immediately available tool that activates the passion in the coach and in the audience. This is the reason why we have conceived KING Flipchart, the greatest in the world. KING's the only one available with a double-wide panel for the panoramic, the landscape, view. Considering that we had to make this job, we also made KING beautiful and gave special attention to the design!